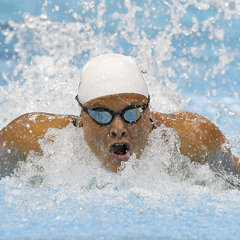 London - Natalie du Toit and Kevin Paul started South Africa’s 2012 London Paralympics campaign on a high note when they both qualified for their respective finals at the Aquatics Centre on Thursday. Du Toit touched first in her 100m butterfly S9 heat in one minute, 9.94 seconds (1:09.94), ahead of Claire Cashmore of Great Britain (1:13.26) and Paulina Wozniak of Poland (1:13.56). Despite qualifying in first place, 1.25 seconds faster than America’s Elizabeth Stone who won the first heat, Du Toit said it took her a while to get going and she hoped her performance would improve in the evening final. “After all the waiting for the Paralympics to start, I still don’t think I’m quite ready for it yet,” Du Toit said. Having trained just once in the Aquatics Centre before the Games began, Du Toit felt the depth of the pool distorted her perception and it would take time to get used to it. “Being three metres deep feels extremely strange, especially going into the walls where it seems a bit of an awkward length,” she said. Paul said he surprised himself by winning his 200m individual medley SM10 heat in a personal best time of 2:14.97. He was only half a second behind the fastest swimmer in the heats, Benoit Huot of Canada. Elsewhere, cyclist Roxanne Burns was less fortunate as she failed to qualify for the women’s individual C4 pursuit. She finished last out of the six entrants in 4:40.874. Susan Powell of Australia was the fastest of the four successful qualifiers, finishing in 4:03.30.